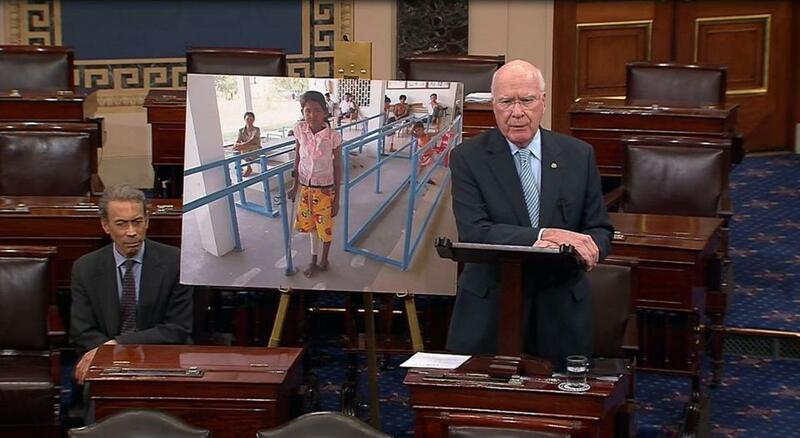 Senator Patrick Leahy, a Vermont Democrat, has spent more than two decades directing federal funding to clear minefields and provide victims with wheelchairs. WASHINGTON — In 2005, then-Senator Barack Obama wrote to a constituent that he would use his influence to help advance an international treaty banning land mines, decrying what he called the “horrific injuries and loss of life” among civilians long after wars end. But in his five-plus years as president, Obama has not asked the US Senate to ratify the pact signed by 161 other nations, showing an unwillingness to take on military officials who assert that the devices, which the Pentagon last used in battle in 1991, are still needed. Instead, his administration has repeatedly delayed a review of the issue initiated early in his first term. Senator Patrick Leahy, the Vermont Democrat who has spent more than two decades directing federal funding to clear minefields and provide victims with wheelchairs, prosthetics, and job training, is so frustrated at Obama’s lack of action that he is complaining bitterly and publicly about it. Indeed, what is most vexing to many treaty supporters is that the United States has done more than other countries to address the problem, but still hasn’t taken up the treaty. In addition to spending more than $2 billion over the last two decades to reduce the threat and aid victims, the United States has halted the production and export of so-called “persistent” or “dumb” mines that have no disarming mechanism and can remain a danger for unsuspecting villagers for decades. “The United States has actually probably lived up to about 90 percent of the requirements of the treaty,” said Lloyd Axworthy, the former foreign minister of Canada who hosted the treaty negotiations, expressing incredulity that the United States has nonetheless long resisted giving up the weapons. Although it was among the first to call for a treaty banning land mines, the United States is now the only member of the NATO military alliance that has not joined the pact. The only other nation in the Western Hemisphere to refuse is Cuba. When treaty signatories meet on June 23 in Mozambique to discuss ways to accelerate the destruction of mines as well as strengthen the pact, the United States will attend only as an observer. In late May, a six-year-old girl was killed and five other villagers wounded in Myanmar when they came upon a land mine near the border with Thailand. The same week the US State Department dispatched a “quick reaction force” to Serbia and Bosnia-Herzegovina where flooding had dislodged land mines left over from the civil war in the former Yugoslavia. 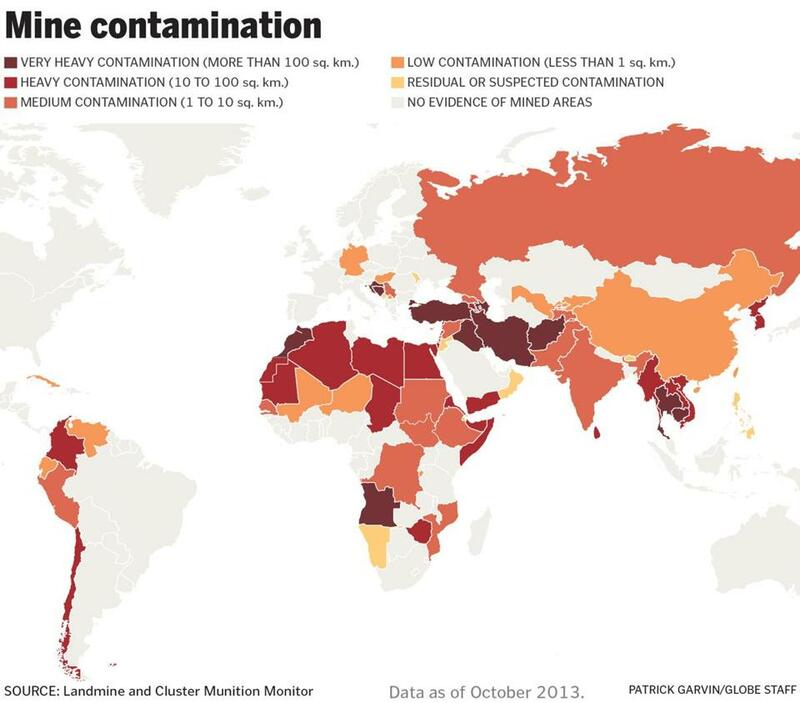 Advocates for the ban believe America’s continued reluctance to embrace the treaty is slowing momentum to render politically unacceptable a weapon that kills or injures an estimated 10 people every day in the 60-some countries where they remain in the ground. For example, US allies Ukraine and Finland have recently signaled they might withdraw from the treaty out of military necessity. Three dozen countries still remain outside the treaty, according to a recent report by the Arms Control Association, a nonprofit advocacy group, including the United States, China, Russia, India, and Pakistan. Together they collectively account for an estimated stockpile of 160 million landmines, while experts say there is no reliable way to estimate how many landmines are still littering global battlefields. The “Convention on the Prohibition of the Use, Stockpiling, Production and Transfer of Antipersonnel Mines and on Their Destruction” was proposed in 1997, requiring member nations to no longer use land mines, destroy all remaining supplies, and remove those planted on their territory. The so-called Ottawa Treaty was heralded as the first global arms treaty to emerge from civil society, as opposed to governments. The International Campaign to Ban Landmines, a coalition of 1,400 nongovernmental organizations from around the world — led by American Jody Williams — was awarded the 1997 Nobel Peace Prize for spearheading the effort, which also benefited from high-profile advocates like the late Princess Diana. The treaty’s unique evolution is viewed as a possible reason why the American military brass is still resisting; the thinking goes that commanders fear that giving up land mines could encourage similar efforts by human rights groups to seek to ban other types of controversial weapons, such as drones. “In all probability, land mines kill more children than soldiers, and they keep killing after wars are over,” Clinton said. But he opted not to sign the treaty and seek its ratification after US military leaders insisted that they needed time to develop alternatives to mines. The Bush administration also adhered to that position, while the US Army began developing so-called “smart” mines as a replacement, devices officials say are now ready to be part of the arsenal. One alternative, called the Spider, is designed to detonate only by command and to self-defuse after a limited period. It is designed and built in part by Textron Systems in Wilmington, Mass. Textron officials did not respond to a request for comment. When Obama came into office in 2009 there were high hopes that he would seek to join the treaty; he instead ordered up a review that has gone on for five years. Asked about the assessment, Edward Price, a spokesman for the White House’s National Security Council, said, “We are pressing forward to conclude our review of US land mine policy” but declined to provide details. A Pentagon spokeswoman, Lieutenant Commander Amy Derrickfrost, defended the military’s position. She said that in addition to ending the use of so-called “dumb” mines in 2010, the US military also no longer uses plastic mines, which cannot be identified with a metal detector or other mine surveillance technologies. But the military continues to say that it must have the ability to use anti-personnel land mines. “I consider them to be an important tool in the arsenal of the armed forces of the United States,” General Martin Dempsey, the chairman of the Joint Chiefs of Staff, told a congressional hearing in March, especially on the Korean penninsula, where they are intended to help blunt an invasion by the North Korean army. The Pentagon position has its share of supporters on Capitol Hill, including Representative Randy Forbes, a Virginia Republican, who calls land mines “vitally important to the defense of South Korea.” Fearing that Obama will sign the treaty, he has proposed an amendment to a new defense bill that would prohibit the administration from implementing the treaty. Many observers, however, remain surprised at the extent of opposition at the Pentagon to the treaty. “Some of the guys that wrote the [Korean] war plans were advocates of the mine ban,” said retired Army Lietenant General G. Robert Gard, who traveled to South Korea in the late 1990s at Leahy’s request to make an assessment. A veteran of the Korean and Vietnam Wars, Gard believes that the continued Pentagon resistance is driven by fear that giving in could embolden human rights groups to try to ban other weapons. Meanwhile, the ongoing land mine policy review — the third such assessment since the Clinton years — has treaty advocates such as Williams, the peace prize recipient, deeply frustrated. The gruesome photographs, blown up to nearly life size for maximum effect, line a small, cluttered office of the Senate Appropriations Committee. One depicts a pair of legless men looking up from their wheel chairs, another a woman hobbling along with the help of a stick. The images were all captured by Leahy, an amateur photographer who has personally chronicled dozens of innocent war victims from Central America to Southeast Asia. His crusade against land mines began more than two decades ago in a jungle village in Nicaragua, at the height of its civil war. “There was a little boy, probably 12 years old, one leg, homemade crutch. He’d lost his leg from a landmine,” Leahy recalled in an interview in his Senate office, where some his war victim photos hang at eye level above his desk. Leahy later used his perch on the panel overseeing the State Department budget to establish a US fund to help the most vulnerable victims of war, which was later named the Leahy Victims Fund. He also provided money for mine clearance groups around the world. Leahy later proposed legislation prohibiting the United States from exporting land mines. To help convince a skeptical Senate, he persuaded DC Comics to publish a Batman comic edition in which the caped crusader, in his effort to rescue a child, had to walk through a minefield. Leahy provided a copy of the special issue to every senator; his legislation passed by voice vote without opposition. He now remains optimistic that if Obama would sign the land mine treaty and send it to the Senate for ratification it has a good chance of garnering the required two-thirds, or 67 votes, to pass — despite the overall partisan rancor.